The Packard Motor Car Company, which built Detroit’s first, and for many years most prestigious, luxury cars, produced over 1.5 million vehicles from 1903 to 1954. The Packard factory complex on Detroit’s East Grand Boulevard in Detroit was designed by Albert Kahn, the foremost American industrial architect of his day. At its opening, it was considered the most modern automobile manufacturing facility in the world. In it skilled craftsmen practiced over eighty trades. Many of the offices in the Packard factory buildings were constructed with wall paneling made of first-growth Oak that cannot readily be found on the market today. The Packard Motor Car Foundation and Authentic Packard LLC have reclaimed all remaining wood paneling and this affords a nice opportunity for this wood to be recycled and used in historic preservation or for present-day uses. Authentic Packard is a Detroit-based organization that has carefully removed the wood from the Factory. It is now preparing for sale and marketing it for the Foundation, with a portion of the proceeds to benefit the Packard Proving Grounds Historic Site. This is a unique opportunity to own a piece of automotive history, a conversation piece that is in limited supply. The wood, its potential hidden for over fifty years has been saved and is available for historic restoration or for new uses. This is all there will ever be. Oak is the major type of wood recovered from the site and is indicated by tight growth rings, and a straight grain pattern. This wood was likely two to three hundred years old when it was installed a hundred years ago, and is of the highest quality. We have 1x up to 8”, 5/4 and 2x up to 6”. Although we have a variety of pieces up to 16′ in length, the most plentiful pieces are 1″ x 8″ and 3′ long. The wood can also be custom trimmed and laminated with multiple pieces to create the dimensions you need. It is well suited for wall paneling, wainscot, trim molding, custom furniture, picture frames, and plaques. Oak crown moldings and a limited number of doors from the site are also available. 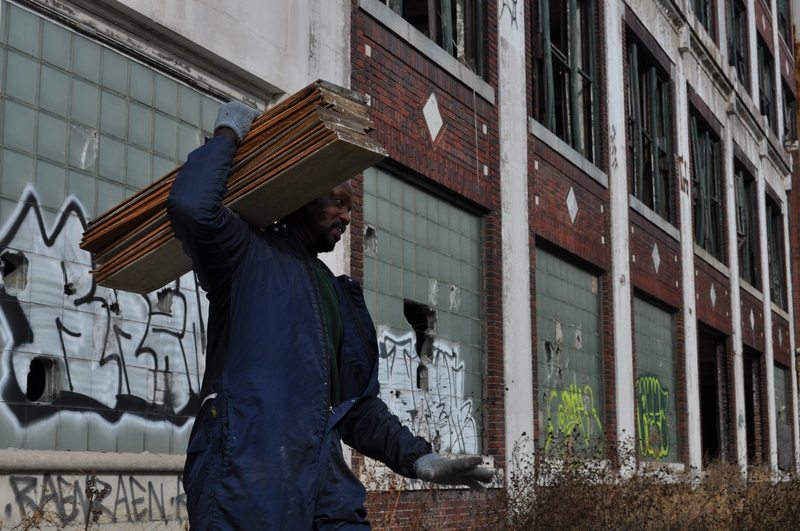 Vintage wood pieces were reclaimed from the Packard factory offices on East Grand Boulevard in Detroit in November 2009 by six licensed contractors and over 50 individuals. The lumber was carefully removed and transported to a storage facility at the Packard Proving Grounds in Shelby Township, Michigan. The work was completed without injury to any workers. Please see the video page for a more detailed look at the salvage process.